THE SOLUTION to the Mission 9 Student Challenge: Understanding Weightlessness – You Want Me to Take a Bathroom Scale Where? To teachers starting Mission 9 to ISS, this challenge was posted a week ago on Monday, September 14, 2015. It is designed to help you get your students immersed in Mission 9 microgravity experiment design by first exploring the concept of microgravity (often referred to as the phenomenon of ‘weightlessness’). As promised, here is the solution to the Challenge. Ok, I know you’ve been perplexed, and hanging out on the edge of your seat for the last few days. You’ve been patiently waiting for me to read my bathroom scale on top of my 260 mile high mountain that apparently even the U.S. Geological Survey knows nothing about (I checked at their web site.) Wait! You say you have no clue what I’m talking about? Hey, you’ve got to read the original challenge FIRST! None of this lazy stuff going right to the answer. So I go to the top of my 260 mile (420 km) high mountain, and look … here comes the International Space Station … and there it goes! Man, it was moving fast. It was cruising at a whopping 4.7 miles PER SECOND (7.6 km/s)! Just 2 seconds ago it was heading right for me but was 4.7 miles away. A second ago it flew right by my face, and I looked in the window really really fast. And now it’s 4.7 miles away, heading away from me really fast. Metric system note: in the metric system, which is the system of units used by researchers and in science classrooms, weight is measured in Newtons (N). 150 lbs is equivalent to 667 Newtons (N). At the top of my mountain I’d weigh 90% of my surface weight, so I’d weigh 600 N.
First some gravity basics. The force of gravity exists between any two masses, e.g., you and your chair, or your car and the fire hydrant it’s parked next to (hey move your vehicle.) But as forces of nature go it’s a really weak force. So for you to easily see it in action, at least one of the masses needs to be really massive. A good example is the force of gravity between YOU and the EARTH. The Earth is pretty massive, and the force exerted on you by the entire Earth is what we call YOUR WEIGHT. The force between two masses also depends on the distance between them. If you increase the distance between two masses, the force of gravity decreases. This comes together mathematically in the LAW OF UNIVERSAL GRAVITATION, a cool and pretty simple equation courtesy of Mr. Isaac Newton. Ok, now let’s apply this. In the case of you and Earth, the distance between you and Earth is actually the distance between you and the center of Earth. But that distance is just the radius of Earth, or 3,963 miles (6,378 km.) When I go from sea level to the top of my really tall mountain, 260 miles (420 km) high, I’m increasing the distance between me and the center of Earth only a little bit. So my weight only goes down to 90% of its value at sea level. I actually used Mr. Newton’s equation to calculate my weight on top of my mountain. For those of you that want to see the calculation, I wrote it in my scratchy long-hand HERE. 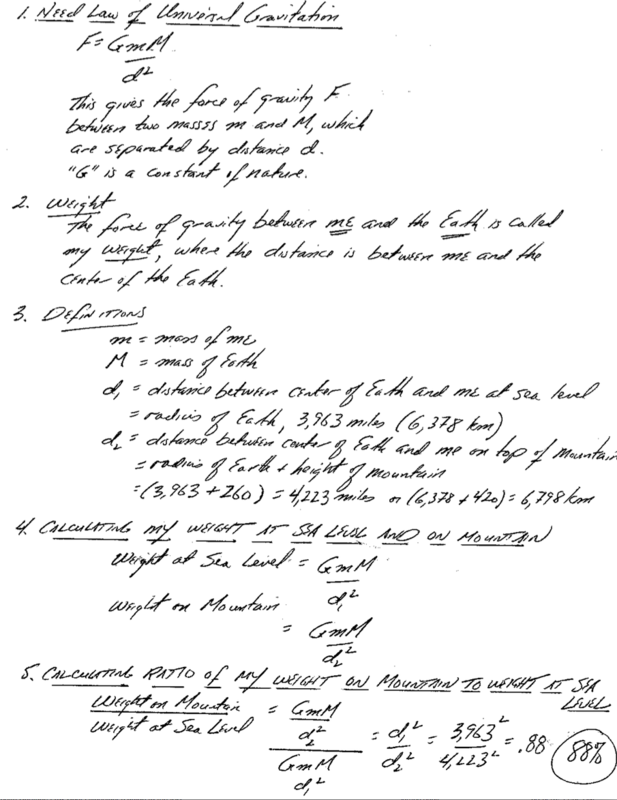 (Note my calculation shows more precisely that on the mountain I weigh 88% of what I weigh on the surface of the Earth. I’ll round that to 90% since the space station orbit can also be a little lower than 260 miles altitude). Here’s another thing to ponder. The International Space Station (ISS) is pretty massive compared to you, and when it goes into orbit at 260 miles altitude, the force of gravity the Earth exerts on it – its weight – is also 90% of its weight at sea level. The weight of an astronaut is also therefore 90% of his/her weight at sea level. THEY ARE NOT WEIGHTLESS. The term WEIGHTLESS leads to a deep misconception. They only APPEAR weightless. Big difference. Again, your weight is the force of gravity exerted on you by the Earth. There is NO question that such a force is exerted by Earth on both the Space Station and the astronauts inside. 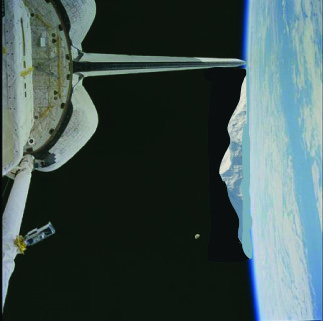 But the Space Station is not resting on a mountain or anything else. The Space Station is ONLY experiencing the force of gravity. When that happens we call the situation free fall. The International Space Station is falling!! This seems contrary to the way most of us think about falling objects, where an object that is falling is headed toward the Earth. But that too is a misconception. The Space Station is only experiencing the force of gravity, it is therefore falling – and it is moving around the Earth! Here’s something I wrote for a grade 5-8 lesson on free fall (See the “To Community Leaders and Teachers” section below), and it explains how you can be falling around the Earth. Now back to the idea of weightlessness. Here is an analogy to help you understand. You’re in an elevator in a tall building. The elevator is on the top floor, not moving, and the elevator has no windows. Inside the elevator you’re standing on your bathroom scale. You note the scale reads your correct weight plus a couple of pounds ’cause you just finished lunch at the very cool top floor restaurant. Two forces are acting on you—gravity pulling you down, and thankfully the floor of the elevator pushing you up. Now (sorry) I cut the elevator cable. You feel that in your stomach? You’re now in free fall. You’re falling because I removed the ability of the elevator’s floor to push you back. The floor of the elevator is now falling WITH you. And the bathroom scale between your feet and the floor? Well, it’s also falling WITH you! There is now no way for the spring in the scale to be compressed between your feet and the floor … because the floor isn’t going to be pushing back. Look at the scale … it reads ZERO. You are weightless! Oooh oooh! Got it! Here’s another way to think about the elevator! Ok, imagine you’re back at the top floor and inside the elevator you are standing on a small chair, which puts you 1 foot above the floor. You decide to walk off the edge of the chair. But at the moment you walk off the chair you hit a button on the wall that detaches the cable holding the elevator, and the elevator and you plummet downward together, accelerating under the action of gravity. Now you are accelerating in the direction of the elevator’s floor BUT the elevator’s floor is accelerating in that same direction, which is away from you. You’ve stepped off the chair, but you never get any closer to the floor! What do you see as a passenger inside the windowless elevator? You’re not aware of anything moving. Inside the elevator, you are floating a foot above the floor, as if weightless! So here is the deal. If you are inside something falling (in free fall) like an elevator or a Space Station, you appear weightless. That’s because everything inside is falling with you, including the floor, walls, and ceiling—though calling them floor, walls, and ceiling is now rather meaningless. So what I said above would definitely be the case if the air in the elevator shaft were removed. And for the Space Station, well it’s in OUTER SPACE (say it with an echo for effect), and above the atmosphere, at least 99.999% of the atmosphere, and it is therefore truly falling – but moving around the Earth. That’s how I can read 90% of my weight standing on the mountain, and still see “weightless” astronauts inside the Station as it flies by the top of my mountain. For your next stop on this journey in real science and real spaceflight, go check out the Designing the Flight Experiment page. Good luck to all SSEP Mission 9 to ISS student microgravity researchers!